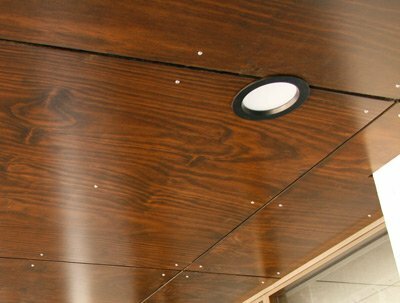 Having worked with FA Mitchell in the past, Salex Ceilings knew they could count on us to deliver the right panels for the job. 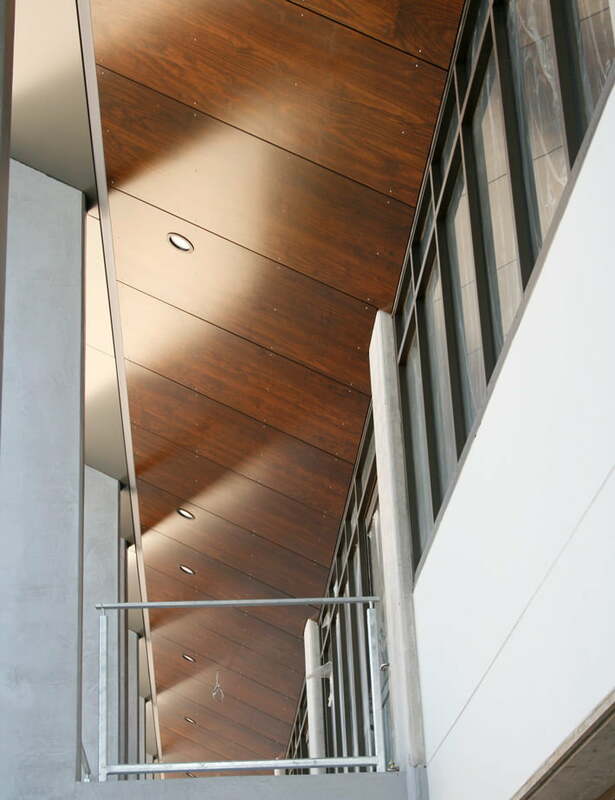 The architect that Salex Ceilings worked with had specified the type of panels needed for the soffit, including the staining, thickness and insulation method. In this case, the exterior panels they asked for were Ariaply. The panels were to be 2400mm by 1200mm and have a 9.5mm thickness. Since we are official Ariaply distributors and had worked with Salex Celings previously, we got the call. 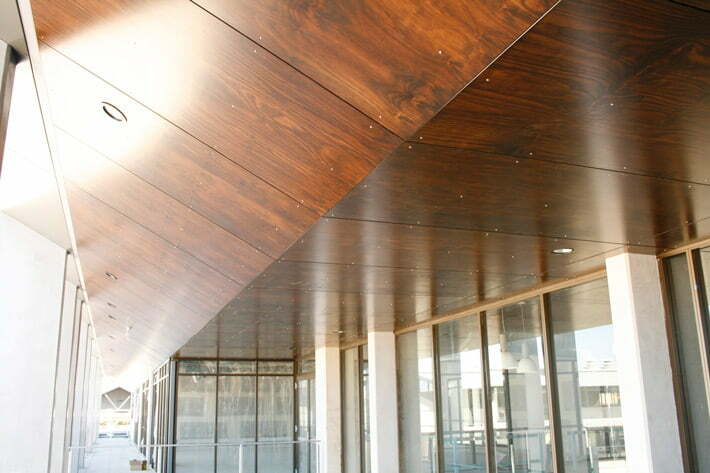 Ariaply is manufactured from premium Hoop Pine exterior plywood and features a special 3 coat system. 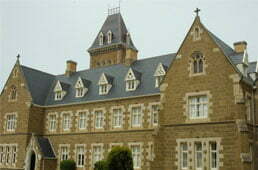 This makes it highly durable for external applications while being appealing to the eye. 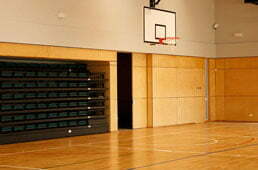 We supplied a total of about 650 square meters of Ariaply exterior plywood panels. 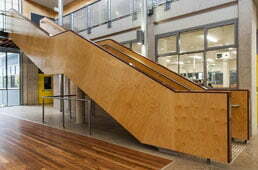 As per specifications, we provided the Ariaply pre-stained with a spotted gum stain. 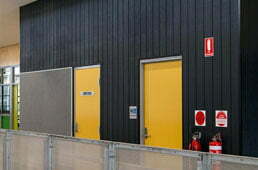 Generally it takes about 4-5 weeks for us to supply orders for this type of external plywood cladding. 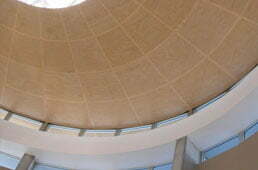 In addition, we supplied Salex Ceilings with a coloured sealing paint. The builder used this to repaint the panel edges where they had to make cuts. This was necessary to fit panels into certain areas, such as around columns or edges. Although not directly exposed to sunlight or the weather, it is important that you seal all edges whenever you have to make cuts. That’s exactly what Salex Ceilings have done. Salex Ceilings screw-fixed the plywood to metal furring channels. This means the actual fixing was done through the face of the panel, into the furring channel. Using stainless steel screws for this type of fixing meant the screws created a nice contrast with the dark panels. The builder applied the screws in this manner around the perimeter and along the centre of the exterior plywood panels. Salex Ceilings left a small gap of about 10mm between each panel. 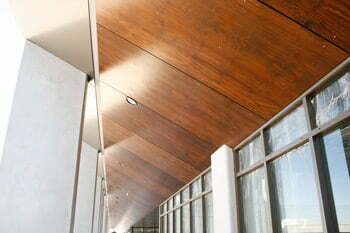 We actually fulfilled two separate orders for the plywood for Salex Ceilings. After the initial order, they did the bulk of the installation and then requested an additional order of panels to complete the smaller areas. The design for this project had lights embedded into the panels. Salex Ceilings cut the panels to make way for the lights. They also cut the panels to fit in certain areas around the columns. Before mounting, they recoated the edges with the coloured sealing paint we had supplied. The application of the exterior plywood cladding was complete in mid-May 2018. Needless to say, we are very proud to be associated with this project and the very high quality result. In the photo below, you can see that there is a slight gap between the bottom of the sloping panels and the start of the horizontal ones. This is to avoid the overkill of trying to make these panels seamless. There really isn’t much point in trying to do this and it would have added a lot of time and complication to the project. This is because the builders or us would had to cut the edges of each panel at just the right joint angle. The Ariaplay panels will continue to look great for a long time to come. The coating itself has a seven year warranty on it, before it may need to be recoated. The plywood panels themselves should last over 20 years. 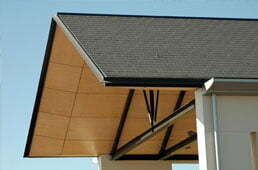 However, the panels are for the most part not exposed to direct sunlight and weather. Consequently they should retain their current look and characteristic for a very long time to come. This is one of the benefits when choosing the right kind of panels for the job. FA Mitchell makes precision cuts on plywood, and we have decades of experience making special cuts. With our expertise, we move fast and above all make sure you order the right material. We can supply large quantities of Ariaply, typically within 4 to 5 weeks. 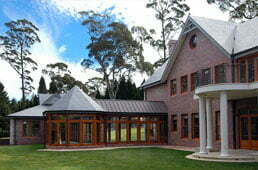 The same goes for other types of speciality timber and hardwoods. Note that you want to allow for some wastage when you place your order. There will always be some off-cuts when you fit your panels. Subsequent orders to fill gaps tend to attract significantly higher unit costs than a single large shipment. So the best is to order a little extra and build that into the cost of your project. We pride ourselves on speed, accuracy, and no wastage. 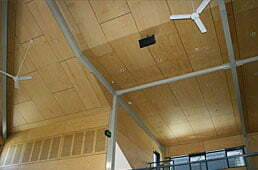 Being environmentalists ourselves, the plywood we offer is sourced from accredited plantation forests in Australia. We stick to stringent Australian standards and our products are audited by the Engineered Wood Products Association of Australasia (EWPAA). Why not contact us today and find out how we can help you with your external plywood cladding needs?